I have often thought about what the definition of art might be. What could such a concept mean? It appears so grand, at least much of the time, to our everyday selves, so beyond the ken of the ordinary, and therefore so elusive, so elevated, so noble, so distinguished – well, so magnificent. The latter word, itself, coming ultimately from its original Latin roots, “magnus” and “facere,” meaning “great” and “to make.” Does not art, in fact, have to do with the making of great things? Is there, then, a single definition of what art is? One that can span the chasm of all the possible forms that art, as we normally think of it, can take? Indeed, can such a high-minded thing as art, so grand a concept, if that is what it is, ever be pinned down to anything as prosaic as what we might think of as a definition. Definitions, after all, help us understand things, help us grasp them, and does such a notion not fly in the very face of art as being a thing beyond the grasp of us ordinary mortals? We are, surely, most of us, determinedly concerned with the diurnal, with the day to day business of living, and making a living, of taking care of our usual, and our usually not so distinguished, needs, as well as the needs of our loved ones around us. But if we were to know what art is, if we secretly dared to define it, then suddenly it might come within our grasp. It would be as if the preeminence of on high were to visit the humdrum tedium of the conventional, as if a Great Light were to be shined, not onto darkness perhaps, but instead onto what we might call the dim twilight of our unremarkable lives. But here, are we not treading upon dangerous ground? Are we, seemingly, about to conflate the notions of art and spirit? Or Art and Spirit, if you wish. And if there is one thing we modern people know, it is that art and religion have long ago parted company, if ever in fact they truly walked together hand in hand on this long-suffering earth. The art of the past, while often, or even mostly, religious in expression, was perhaps largely so because conventional churches had power and prestige, and the money that accompanies both. As such, religious leaders could call the shots. They were able to determine what was created, by whom, and what was to be seen where. It follows as the day the night, then, that they had a natural wish to underpin and undergird the very myths and stories which gave them authority and influence in the first place. Some would say that, if art is anything, it must be a reflection of its time. Or else, how can it speak to anyone living in those times, how can its language translate, as it were, across the ages? But, in fact, we know that great art does bridge the gap of time. Who cannot, for example, look at the Apollo Belvedere, or the statue of Laocoön and his sons fighting the writhing serpent, or Michelangelo’s David, or those enormous Olmec Heads standing and gazing out into mystery, or Shiva Nataraja of the Cosmic Dance in perfect balance between spirit and nature, and not feel in some deep sense what its creator felt? And let us not forget art this is more ephemeral either. Let us not neglect all of the great masks created in straw or fiber or wood, made by what so-called civilized people have scornfully and arrogantly dared to call primitives, some of whose works have come down to us through the ages, but much of which has perished on the garbage heap, or in the fire of war and the bigotry and violence of one culture eliminating another. Neither ought we to forget the great art of dance, and all of its attendant arts, of lighting and of costuming for example, some of which again clings to tenuous time, as do the ballets of Europe still performed today and a few of the classics of Modern Dance, but much of which passes away with the passing of one great choreographer or another into the depths of unreachable eternity. Is, therefore, permanence necessary for art? Hardly, it would seem. As even those things we think of as permanent, that made of marble or other stone, or painted upon canvas, or written upon tablets or paper preserved in our libraries, or in the so-called “cloud” of modern electronic media magic, all too will someday perish, as surely as did the melting idol, burnt at the destructive hand of the disdainful priest of yet another jealous idol, all too temporarily replacing it. No, art may be long and life short, as the old Latin saying tells us – ars longa, vita brevis – but in the larger scheme, art too struts its gorgeous stuff all too briefly on the larger and broader stage of life. It exists but for a moment, along with those who created it, as well as those who saw, appreciated, and were perhaps for a time moved, or touched, or uplifted by it. Art and humanity, of course, cannot be separated. As glorious and as truly magnificent as are all the other creatures of the earth, none makes art as do people. And yet, of course, we too are animals, roiling in the dust and dirt of our daily lives, toiling and rutting and worrying until we drop from exhaustion, wondering, if we are fortunate enough, for a brief moment what we have done and why. But humans are surely more than that, too. Are we also not in our essence and at our very core great luminous beings, hidden away from each other and from our own selves in temporary bodies of flesh? As such, we are capable of experiencing life in its deepest, most intimate, as well as its most visceral form. Yes, there is no doubt we are always and everywhere full of the play of opposites, expressing both the highest and the lowest, able to accomplish everything from the greatest acts of kindness and compassion to the meanest deeds of degradation, from the grandest works of art to the most hideous and horrifying destruction. This is, after all, what it means to live in the physical world, a place of incalculable beauty and wonder, and of the most profound imperfection and of all manner of failing. Even so, there are times when it seems we are capable of seeing up and beyond, or if you prefer, deeply within. The metaphor itself is not as important as the act. It is this seeing that is the essence of art, or at least its beginning. Beyond that then comes how we speak of it, for to be truly representative of this depth of vision, we must summon some kind of thoughtful, and thought out, expression thereof. Art must surely not be a thing dashed off in a haphazard moment, but something prepared, constructed, assembled using both emotion and intellect, and worked on in a fully conscious way. Inspiration may be the beginning of art, but only discipline can complete it. And I am not talking here of words only, for we are doubtless capable of speaking in every medium, and using every tool at our disposal. A single definition of art must, therefore, encompass these notions, these ideas, these profound truths, all of which point, however imperfectly, to a meaning that shows that we are somehow more than what we at first may seem to be. Indeed, if in the end art is not the external, disciplined expression of what is ultimately internal and transcendent in the human heart, then I confess that I do not know what it is. Statistics come and go, at least in my mind. It’s hard for me to hold onto the myriad of numbers quoted, misquoted, and laid down as fact, which we all come upon in any given day’s newspaper. However, one such item I read recently has stuck with me, and it is this: the United States spends more money on defense than all the other nations of the earth combined. The question that this obviously raises is simply to ask why. Why are we spending more than seven hundred billion dollars each year on defending our country? And against whom are we defending it? For many years, the answer to that question was, against Communism. Do you remember Communism? It was that world evil which wanted to spread its unholy gospel of Godlessness and suppression over all the nations of the earth. Please do not misunderstand me; I am no fan of Communism. Its totalitarian madness found its apex in the frightening excesses of Stalinism, and no sane person could want that. Therefore, as long as the old Soviet Union and “Red China” were out there, waiting to take us over, then we had no choice but to spend and spend in order to defend ourselves, didn’t we? Or did these countries arm themselves to the teeth because they saw that we were arming ourselves to the teeth, and so pretty soon everybody’s mouth was too full of guns and bombs and missiles to talk to each other? If so, it was expensive dental work, and remains so today, when even the term communism is beginning to take on a quaint and, dare I say, almost nostalgic tone. The Russians, of course, continue to oppose us in many areas of world politics, as do the Chinese. Still, nobody in his or her right mind can think that they are about to attack us. They’ve got enough to contend with internally, and externally they are no more or less aggressive in their geopolitical intent than we are. It does appear, though, that we need some kind of opponent to justify our continuing to spend those seven hundred billion dollars on. That justification is, of course, the so-called War on Terror. Iraq, Iran, Afghanistan, Yemen, Somalia, and now Mali, and other hot spots around the globe, have taken over and become the great bugaboo that communism once was. Even North Korea, as pathetic and crippled a country as exists anywhere on earth, rises to threaten us. So, is this why we have military bases in so many countries around the globe, although we are virtually the only nation on the planet that still maintains them? Is this why today, some sixty-eight years after the end of World War II, we still have fifty-five thousand troops in Germany, thirty-five thousand in Japan, and ten-thousand in Italy? Is this why we spent eight years fighting in Iraq, even though everyone on earth knows that we went in under false pretenses? And is this why we are still in Afghanistan today, after twelve long years, and we still do not seem to know how to fully extricate ourselves? The world is a dangerous place and always has been. It is true that there are people out there who despise us, and I am the first to admit that I would never want to live under Taliban control. I say that because I would be among the first to be hanged if I were under their authority, and if I did not live in a democratic country. But does anyone truly believe that the United States, or any of its allies, is in danger of falling under their dominance? As much as some may disagree, I think of myself as something of a middle of the road Progressive. I am not against all military spending, and I am definitely not against defending ourselves against real attack. But even in the case of the horror of 9/11, was the answer to spend untold trillions – yes, trillions, with a “t” – on going to war with countries which had not actually attacked us in the first place? Were there not, and are there not now, other means at our disposal to combat and to counteract the dangers of Islamic fundamentalism? If we do not wish to hang ourselves on this cross, it is imperative that we, as a nation, achieve some kind of compromise when it comes to spending on the military. We have to decide, for example, whether maintaining so many soldiers in countries across the globe is really necessary from a military perspective, or whether this is more of a proxy related to our greater economic and political prominence. And if so, is this truly a priority of ours, and is it something we can afford, given the internal needs of our country and our citizens? As a whole, Americans do not want to go abroad and fight. This is why we have a so-called volunteer army, because young men and women, for the most part, do not want to be drafted into a force that puts them in harm’s way. And who can blame them, except it is then left to those with fewer advantages in society to do the fighting, because it is one of the few places where they can get jobs and an education? I do not think it is in anyone’s best interest to romanticize soldiering, or going to war. People die there, or if they live, they come home so damaged and traumatized that they have to struggle for years in order to overcome the horror they have both seen and participated in. For their sake, and for the sake of all of us, we must rethink both how and why we engage in military operations, and how much we spend on our so-called military preparedness. If we were even to cut the current Pentagon budget in half, say to a mere three hundred and fifty billion dollars a year, could we not still protect ourselves from ragtag Taliban fighters, and put that freed-up money to better use? We could, but it would demand many other changes, including rethinking why the United States supplies more guns to the world than any other country (to say nothing of guns to its own citizens). What I am advocating for is reasonableness, not apocalyptic change. What I am suggesting is a reprioritizing, not a total revision of our way of life. What I am saying, along with Pres. Eisenhower, is that we can find a way to feed the hungry and clothe those who go unclothed. We can educate our children, rebuild our roads and highways, and take care of our sick and elderly, all the while, protecting ourselves from those who mean to do us harm. But all this will not come about unless we have a reasoned debate about the size of our defense spending, and unless the American people tell Congress and the President to make cutting out-of-control military spending a priority both now and in the future. Robert and I will be on one of two big buses Presidents Day, Feb 17, 2013, traveling from York and Lancaster, PA to Washington D.C. We will join 20,000 or more concerned citizens to move “Forward on Climate Change,” sponsored by Bill McKibben and 350.org in conjunction with the Sierra Club. Presidents Day seems like a good time to tell President Obama, Congress, and all fossil fuel companies that we insist on urgent action to halt and reverse climate change so that future generations will inherit a safe, healthy planetary home. We hope you will join us in this peaceful demonstration. Above, The Rev. 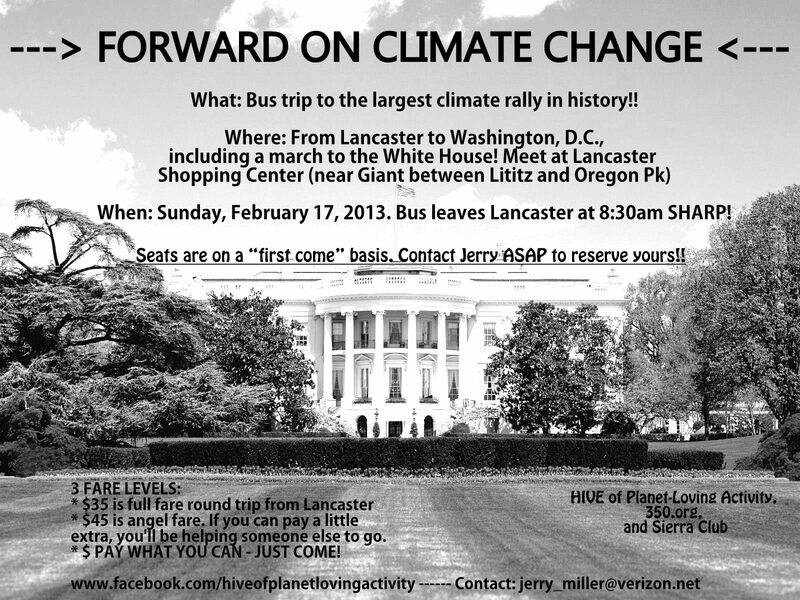 Jerry Lee Miller, Co-Founder of “HIVE of Planet-Loving Activity” in Lancaster and York, PA (check us out on FaceBook) is never happier than when he is organizing busloads of people to save the planet. Thank you, Jerry, for making this Feb 17 DC trip possible for everyone in South-Central PA! Please join us on one of the two buses from Lancaster and York. The fare is $35 per person (or $45 angel fare) or pay what you can. Just COME! Bus #1 will leave at 8:30 am SHARP from Lancaster Shopping Center (near Giant between Lititz and Oregon Pikes.) Bus #2 will leave at 9:00 am SHARP from Giant Store Parking Lot, 275 Pauline Drive, York, PA. We will return around 7-9 pm. Make bus fare checks to “HIVE of Planet Loving Activity,” and mail them to The Rev. Jerry Lee Miller, 1140 Louise Ave., Lancaster, PA 17601. Call him for info at 717-519-9166. More info is available at the “HIVE of Planet-Loving Activity” FaceBook page. A. 2 degrees Celsius (about 3.6 degrees F.) is internationally recognized as the maximum global warming the planet can sustain. The earth has already warmed almost 1 degree Celsius, and there is another 1 degree of inertial warming built into the system even if we halt emissions now. B. 565 Gigatons of C02 (a gigaton is a million tons) is the maximum sustainable emission permitted by 2050. At current rates of emission, unfortunately, we will reach that level of C02 in the atmoshpere in 15 years, by 2028. C. 2,750 Gigatons of C02 (5 times the sustainable limit) represents the emissions that will result from the proven reserves of coal and oil and natural gas that fossil fuel companies have promised shareholders they will extract and burn. If this happens, the results will be apocalyptic. 2. Also on July 19, 2012, Reuters confirmed one of the worst droughts in U.S. history, which destroyed crops across the Midwest and exacerbated massive wildfires. 3. On July 24, 2012 NASA’s Godard Space Flight Center released satellite photos of unprecedented Greenland ice sheet melt that occurred from July 8-12, 2012. In the past several years two huge chunks of the Greenland ice sheet have broken off and floated away — both of them much larger than the size of Manhattan. 4. In early November 1000-mile wide mega-storm Sandy wrought $50 billion of damage on the U.S. East Coast. Aside from the loss of property and lives, many people lost businesses, homes and livelihoods. Thousands are still suffering. 5. Recently NOAA announced that 2012 was the hottest year on record for the U.S.
6. In 2012 arctic ice melt encompassed an area larger than the U.S.
7. The oceans are now 30% more acidic, causing sustainability issues of many kinds. The atmosphere is 5% wetter, making more hurricanes and mega-storms like Katrina and Sandy inevitable. A. What can I do? B. What am I willing to do? C. What am I qualified to do? Then decide what you WILL do to help call attention to this global climate emergency and to persuade governments and fossil fuel companies to stop greenhouse gas emissions and switch to safe, sustainable, clean energy. Most Americans were thrilled to hear President Obama pledge action on climate change in his second inaugural address earlier this week. But the old story about FDR and Social Security applies. When his supporters came to him describing the urgent need for Social Security, FDR is reported to have said something like, “I agree with you. This is the right thing to do. Now… Make me do it!” President Obama needs massive public pressure to support his commitment to respond urgently to climate change. Let’s make him do it! The time is NOW! If you can stand with 20,000 concerned citizens on President’s Day in Washington D.C. we will join hands and affirm survival strategies for all life forms living on Planet Earth — our only home. I’m sure that, like virtually everyone else, you are sick and tired of hearing the same worn out old metaphor related to the fiscal cliff. So, I’m changing it right now to sky diving without a parachute. Actually, that also seems like more of an appropriate image anyway, given what we are about to face with the upcoming fight in Congress related to the extension of the debt ceiling, as well as several other fiscal issues looming over the nation. First of all, however, I have to overcome my own distaste when it comes to writing about the subject at all. How we as a nation can be so ill-informed and so misled as to potentially allow ourselves to default on our debt is beyond me. And I do place the blame squarely on those rigid, recalcitrant, unbending and unyielding Tea Party Republicans, who appear to be willing to sacrifice the entire country on the ersatz altar of their inflexible and uncompromising ideology. How many times does it have to be explained to them that the debt ceiling has nothing to do with future spending? It’s about paying what Congress has already agreed to pay. But, of course, there’s the rub. They never agreed to it. They were against it from the get-go, and this is what they came to Washington to prevent in the first place. So, now it’s time for payback of another kind, political not financial. In other words it’s almost as if they want to bring the government down, in – what? — a vain and hopeless attempt at somehow remaking the country in their own deformed image? I’m beginning to feel that the system we have of electing officials to govern us in the first place may be fatally flawed. It seems to me that our method of primary elections in particular has landed us with extremist of every stripe, but mostly those of the ultra-right, who find compromise a dirty word, and who are willing to do whatever it takes to get their own way. This includes holding the entire nation captive to their militant and radically immoderate points of view. Thus, a tiny fraction of revisionist zealots and extremists in the country may yet get to dictate to the 315,000,000 or so rest of us, who would prefer to find a way to a middle ground, where each side gets part of what it wants and what it believes to be fair. Of course, I admit to being a believer in liberalism and in progressive values. If I weren’t, why would I be writing on a blog entitled “Two Old Liberals” in the first place? But I’m an even bigger and stronger believer in democracy, and American democracy is all about living in a pluralistic society, where people with varying points of view must find ways to coexist and together to share governance. I emphasize share in this context, because it is what so many fundamentalists are unwilling to do. They have somehow reached the erroneous conclusion that they have the answers to everything, that they know what is best in all circumstances for everyone, and they are more than willing to impose those beliefs on the rest of us. Sadly, this is true in the religious, as well as in the political realm, and even more sadly the two often go hand in hand. What can be done about it all is another matter. I confess to being somewhat stymied, and I suppose that is exactly what the self-proclaimed Forces of Right probably want. Their bargaining strategy, if that’s the proper term, is to make the rest of us think they really are serious about pushing the country out of the plane, all the while yanking the parachute off of our backs. In other words, to speak non-metaphorically, they want us to think that they will allow the United States of America to default on its debts, thus pushing the country, and the world economy, into chaos and confusion. After all, for all of our foibles, the US is still the pillar of political and economic stability in the world. As such, what does everyone else do if we fall into some kind of political and fiscal anarchy? The President’s approach seems to be to call their bluff, and I’m not sure exactly what else can be done. He is not, I don’t think, doing so simply to see if they are bluffing, however, but because he has been through all this before. He knows with whom he is dealing, and what they are capable of. And he is relying on the American people themselves to rise up and to make their voices heard. If enough of us raise enough of a hullabaloo, then maybe even the Republicans – or at least some of the more reasonable ones – will actually listen. No one is saying, by the way, that the country does not have to look its debt crisis squarely in the eye and do something about it. It’s clear to most of us that we cannot keep living beyond our means. And a sixteen trillion dollar debt is very much beyond our means! Serious discussions have to take place in Washington and elsewhere to see how we can deal with this. And as always in human behavior, the answer usually is somewhere in the middle. In this case, that means both spending cuts and ways to create new government revenue. I’m not even speaking necessarily about new taxation, although that too has to be seen as a possibility. Additionally, the biggest spenders have to be looked at, namely the so-called entitlement programs and the military. But this is a much larger question, and an obviously more complicated one. One that will demand all of our fortitude and our honesty as a nation state. In the meantime, however, incurred debts must absolutely be paid. That is how both the world and the financial markets work. Let us, therefore, not allow a few fanatics to hold the rest of us hostage. Let us make our voices heard, and remind Congress that bills have to be paid. Once we have shown ourselves, and everyone else, that we continue to be responsible citizens of the world, then perhaps we can begin to go about creating parachutes to ease our descent from other fiscal and political heights. Holiday Decorations Should Stay Up Until Spring! TO: Everyone who feels pressured to take down their holiday decorations during the first week of the New Year… CHILL! I hope you are not sustaining any undue strain or injury from taking down your tree and holiday decorations much too unnaturally prematurely. I should think those cheerful embellishments might not acquiesce without a fight! For our part, Robert and I are sitting in our living room (photo above) on New Year’s morning, secure in the knowledge that our beautiful tree and wreath and window garlands will remain up through our March birthdays, when, with any luck, the crocuses will be peaking through the ground. Spring flowers are the official signal that it is time to put away Christmas decorations for the year, ladies and gentlemen. What ARE Christmas ornaments and evergreens but poor manmade substitutes for the glorious flowers and leaves of nature? Therefore, they should be put up immediately upon the falling of the last colored leaf and remain up until spring flowers burst forth. That is the natural order of things. We hope you will eventually see the error of your ways and join the movement to voluntarily extend holiday cheer until nature takes over every spring.